The theory portion was presented by Barbara Heidenreich, Natural Heritage Coordinator, Ontario Heritage Trust, who did a masterful job of making a lot of information digestible. She reviewed existing provincial policies, and spoke of the challenges of establishing effective tree protection by-laws. There are provisions within Ontario legislation for protection of trees. Unfortunately, few people are aware of these provisions, and only become interested in tree protection when a specific tree or stand is already slated for removal. As well, even when citizens are actively engaged in tree protection, as with many issues, protection is only as good as enforcement and penalty provisions. The Ontario Heritage Act has been used successfully on rare occasion to protect trees. The Planning Act and Sections 135 – 141 of the Municipal Act allow municipalities to protect trees very effectively. It is up to the community members to ensure these tools are used. Tree protection begins long before the whine of the chainsaws. The field advisers will be the first point of contact for many people who are interested in saving trees they believe to be valuable. Therefore it is important for the field advisors to continue to stay current on information regarding saving trees in their districts. The morning concluded with contributions on “next steps” for the field advisors from Fran Moscall, OHTA chair. The second part of the day was in the “field”, or in this case, Edwards Gardens in Toronto. Peter Dmytrasz Supervisor, Tree Protection & Plan Review Etobicoke York District, led the practical session in his endlessly patient manner, with supporting contributions from Jack Radecki, Executive Director of the OUFC. The criteria for assessing a potential heritage tree were created in 2006 by the Ontario Heritage Tree Alliance, a project of the OUFC. The five factors are: rarity, prominence, appearance, social and integrity. Each of the five factors has sub-factors, and rating guidelines. Peter had pre-designated six trees with various cultural and historical significance, for the workshop participants to practice assessing with “new eyes”. 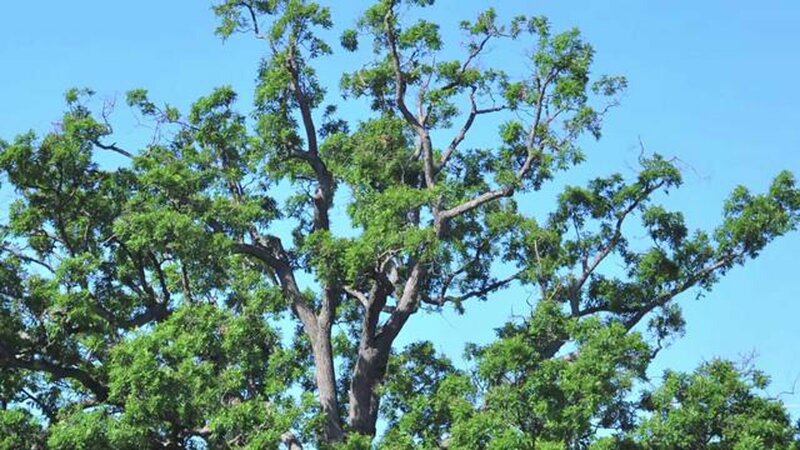 The Black Walnut tree planted in 1900 was a beautiful specimen, but as it had no cultural or social significance, it failed to qualify as a candidate heritage tree. On the other hand, a pair of visually unremarkable Honey Locust trees met the criteria. The unknowing passerby might not realize these two trees were planted at the gate of the family cemetery at the turn of the last century, and as was tradition at the time, were called “husband and wife trees” The field advisors were coached on methods to find cultural and historical information on community trees. Tree history may not be in obvious places. Research may require creativity such as connecting with the local librarian, the local historical society, or chatting with the old timers at the legion or community center. It was noted that while foresters are often known as a fairly laconic bunch, they were coached to “not talk too much” while interviewing community resource people! Talk about a change of “lenses.” In 2006 the OHTA published “Securing the Future of Heritage Tree: A Protection Toolkit for Communities”. The response and interest from communities has been exceptional, and communities around Ontario have been engaged in “Tree Hunts” to find and protect potential heritage trees, guided by the toolkit and support from volunteers from OUFC and beyond. In 2008 Trees Ontario received a grant to build a province-wide database for compiling information on heritage trees. If you think you may know of a candidate heritage tree, please contact a Trees Ontario Field Advisor for further advice and information. To find which field advisor is assigned to your area, go to http://www.treesontario.on.ca/info/. If you would like more information on building community interest in heritage trees, please contact info@oufc.org. Directors of the OUFC would be willing to discuss providing training sessions to your city/municipality. Participants from Trees Ontario were: Ed Borczon, Scott Brown, Al Corlett, Donald Gummer, Greg Greer, Brian Swaile, Adam Zulinski. Participants and Presenters from the Ontario Urban Forest Council were Barbara Heidenreich, Peter Dmytrasz, Brenlee Robinson, and missing from the photo are Jack Radecki, and Fran Moscall. Locating and documenting Community Seed trees for climate change plantings is an expansion of our view of heritage trees. We need to expand our cultural and historic heritage view of trees, to include tree species as our biological heritage, as well. Individual trees, avenues and groves and stands of trees are threatened by climate change during the next 30-100 years. Heat waves and droughts will affect photosynthesis, tree performance, tree health, and seed set. Across this province, individuals and community organizations are working to recognize and protect urban forests and heritage trees which are so integral to our healthy environment and social history. In 2006, the OUFC brought out its Heritage Tree Toolkit, to provide comprehensive tools, in lay-language, to help individuals and organizations eager to protect their oldest trees. In 2009, Trees Ontario began working with the OUFC on Heritage Tree protection and now provide an on-line nomination form (or you can use the paper version in our Toolkit). Either way, trees deemed to be potential candidates are inspected by Trees Ontario foresters, and if they get the nod, are then reviewed by a panel which includes representatives from Trees Ontario and the OUFC. Trees which receive the formal designation are entered into the Trees Ontario Heritage Tree database at www.treesontario.org. Across this province, we are witnessing remarkable stories of personal tenacity and achievements which came about through hard work of individuals who persist through frustration, through joy and through humour to protect their treasured trees.